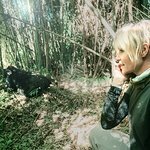 Portia de Rossi is currently in Rwanda with The Ellen Fund – The Ellen DeGeneres Wildlife Fund – for a ceremonial groundbreaking of the Ellen DeGeneres Campus of the Dian Fossey Gorilla Fund. “I’m in the north of the country on the edge of Volcano National Park and it’s stunningly beautiful here,” says Portia. Tonight I will fall asleep knowing that, in the national park just down the road, there are magnificent mountain gorillas also sleeping – the last of them in existence. And in the morning we will all celebrate the groundbreaking for the Campus that can help them live on. Ellen and I are so excited!" In 2018, Portia de Rossi gifted her animal-loving wife Ellen DeGeneres with the surprise of a lifetime: Ellen’s very own wildlife fund to provide support to organizations working on behalf of wildlife conservation. The Ellen DeGeneres Campus of the Dian Fossey Gorilla Fund – which will house Karisoke and all of its programs – will be a global example of socially and environmentally responsible design. It will be a place that will accelerate real and sustainable outcomes for an endangered species and the communities who reside near them. That is why the mission of the campus is to make gorillas an entry point for a lifetime of conservation activism.